I think my motto more and more when it comes to holiday decorating is “better late than never”, this year was especially hard to get my Christmas decor up. I don’t know if it’s the fact that up until last week the weather here in Arizona has been almost in the 80’s, or if it’s that this year feels like it literally flew by. 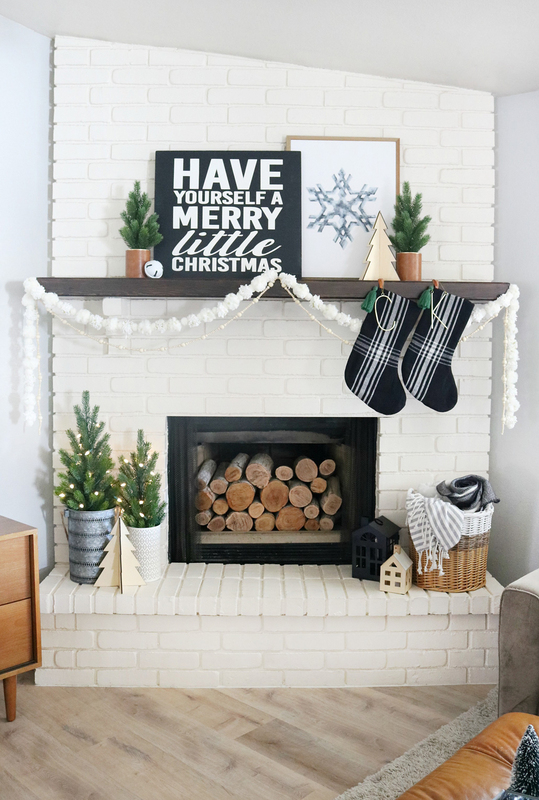 You’d be happy to know though that I finally got my act together and put up my Christmas decor, today I’m sharing my Black & White Modern Snowflake Christmas Mantel Decor. 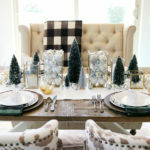 When it came to planning my decor this year all I knew was the color palette, black – white – and hunter green. The tree was easy for me, but the mantel really threw me for a loop this year. It typically comes pretty easy. 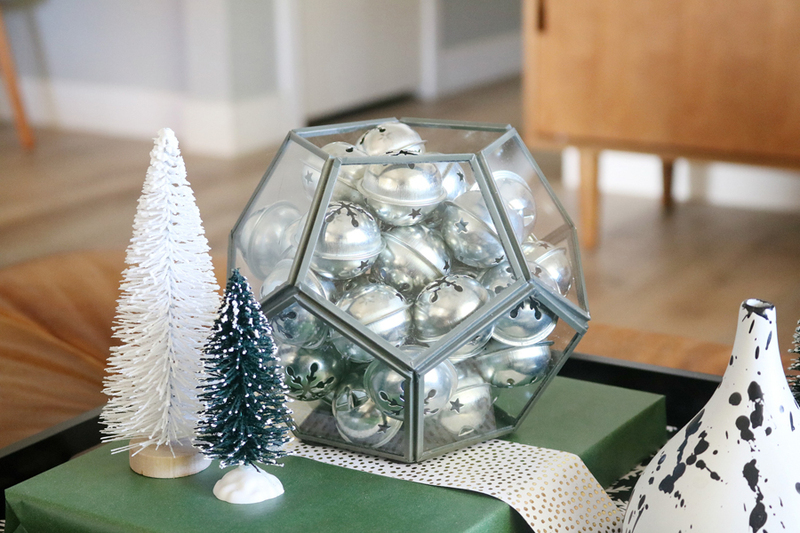 One rule I try to keep when decorating for the holidays is that I shop my home or current decor. If it doesn’t fit my current color palette for the holiday or theme I can switch it up with paint. I like to buy a few new things each year but I really try to be selective about what items I buy. 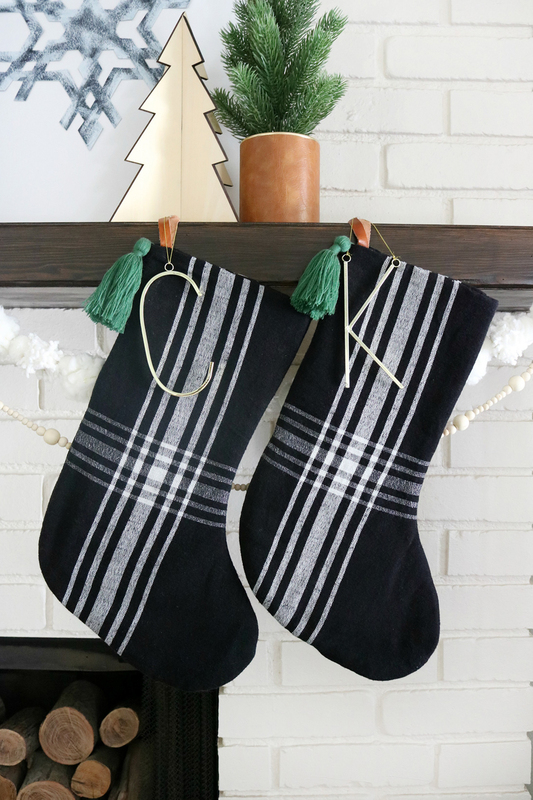 When I saw the new Hearth & Hand™ with Magnolia line for Target I fell in love with the plaid tassel stockings, I knew they’d be a great contrast against the white brick on our fireplace. Plus, they had the leather trim that I already wanted to add to my decor again. I added pops of camel colored leather last year and absolutely loved it and knew I needed it again. Besides the stockings and camel leather, the only thing I had seen that gave me any inspiration was a modern snowflake print I had seen online. Unfortunately, by the time I’d found it, there wasn’t enough time to order it and have it shipped to me. I couldn’t get this snowflake design out of my head. So I decided to recreate it myself. 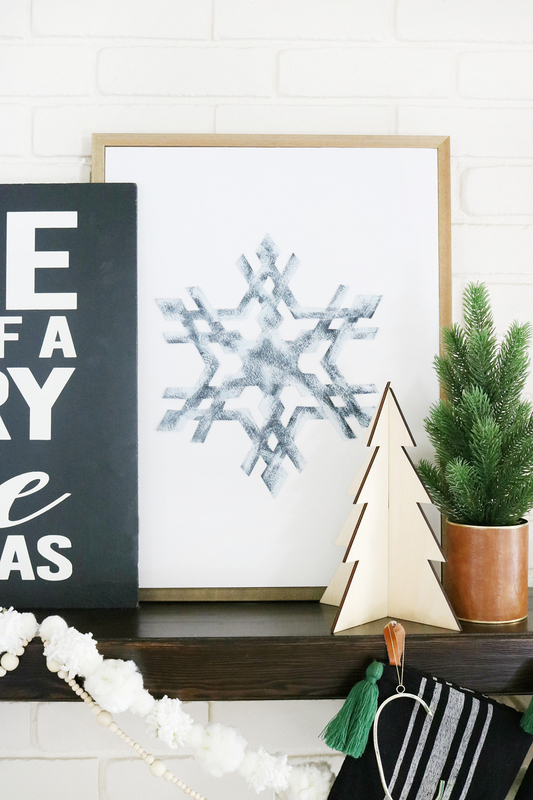 After sketching the snowflake design out on a large piece of black drawing paper from Hobby Lobby I cut it out using a very small pair of scissors, looking back a Xacto knife would have been a better choice to avoid cramped hands. 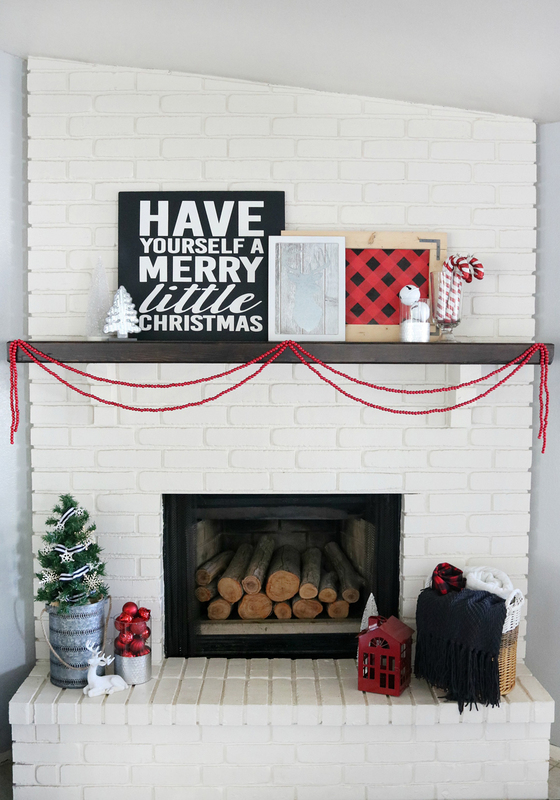 After I had my snowflake cut out I took the same frame from my everyday mantel decor and inserted a piece of white foam core board to create a blank canvas. Then using a little adhesive I applied to snowflake to the center of the white foam core. I decided I didn’t want my snowflake to be solid black since I was going to be having other black elements in the decor. Using a dry brush technique with a firm bristled paint brush I added some white acrylic paint to give it some texture. It turned it a lightly grungier shade of gray’ish. It still had some of the black peeking through which gave it enough contrast against the white background. 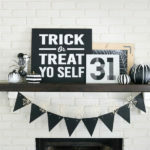 I love that I could create a piece of new decor for less than $4 (the cost of paper) that fit the theme I was going for. 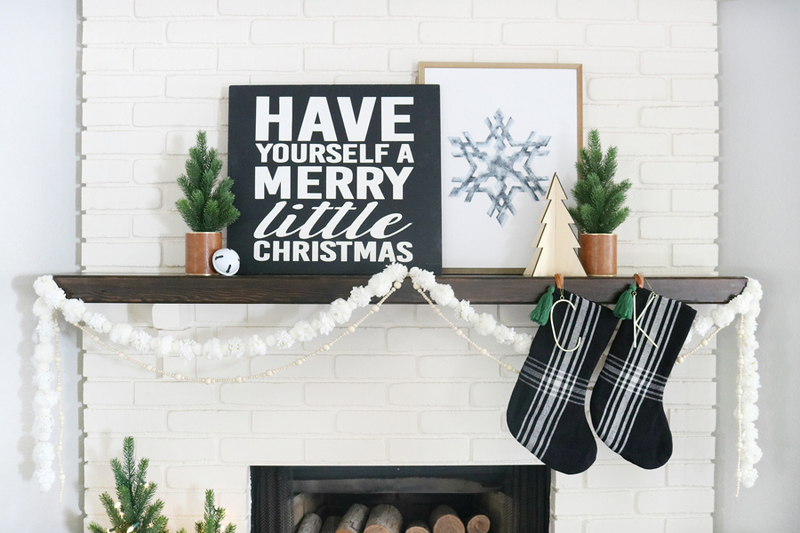 One of my mantel designs from last year was this Buffalo Check Holiday Mantel, the black and white sign that I painted for it was a perfect addition to this year’s mantel. I needed something bold and this was it. Plus, I already had it and wouldn’t need to make any other new art. 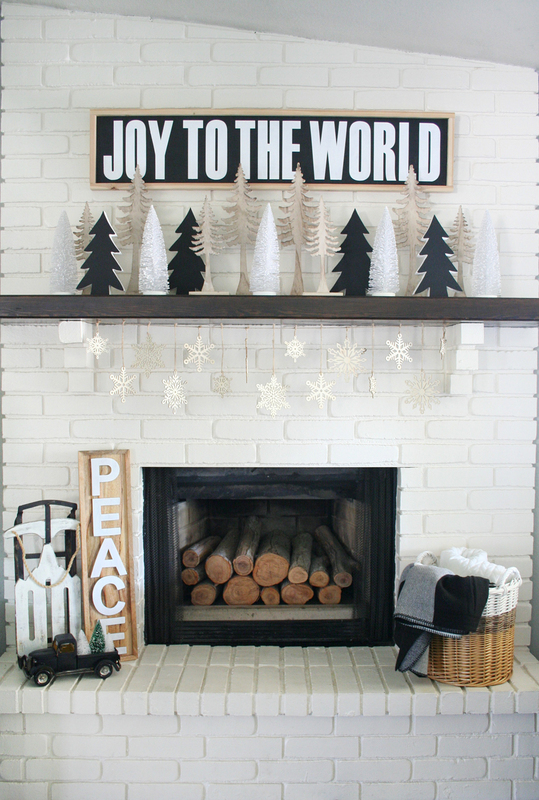 I added the modern raw wood laser cut trees to the mantel and the hearth of the fireplace, I found these at target’s dollar spot last year. 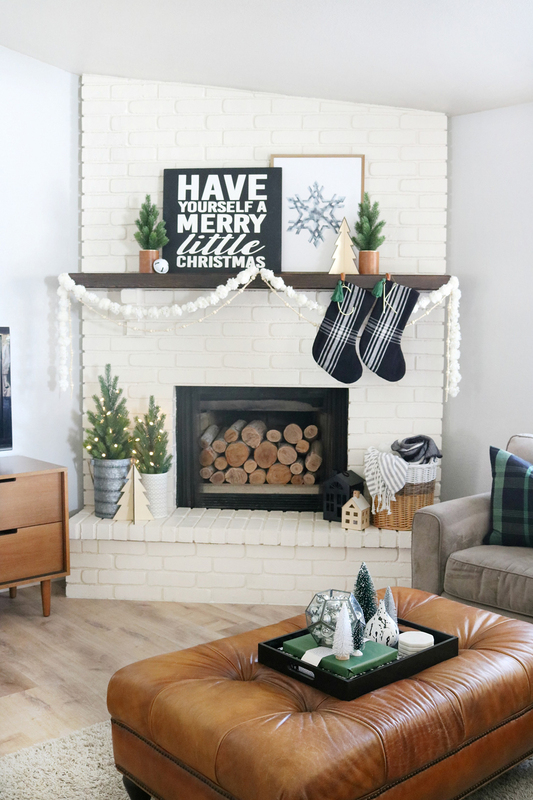 To soften up the decor a little I added the white pom-pom garland I found at Michaels, I took two of them and tied them together to create a longer garland since my mantel is almost 6′ long. It added great texture to the decor. 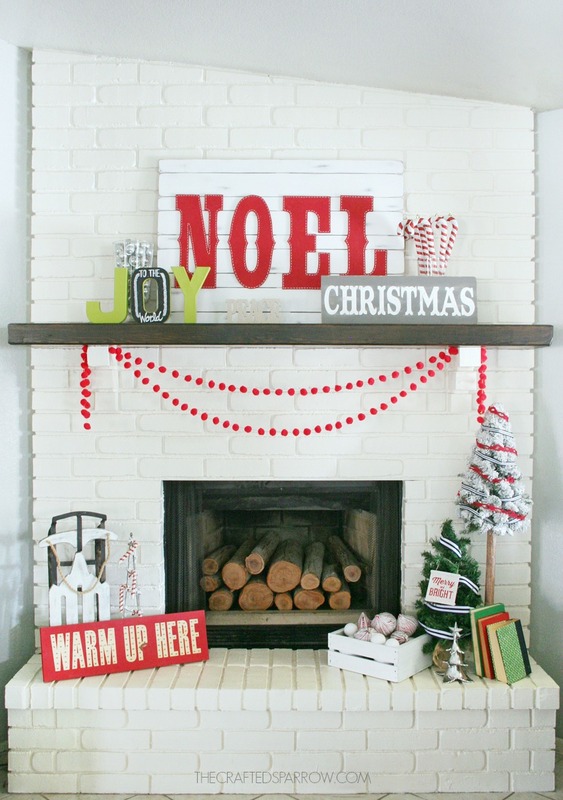 I paired it with the Hearth & Hand™ with Magnolia beaded wood garland. 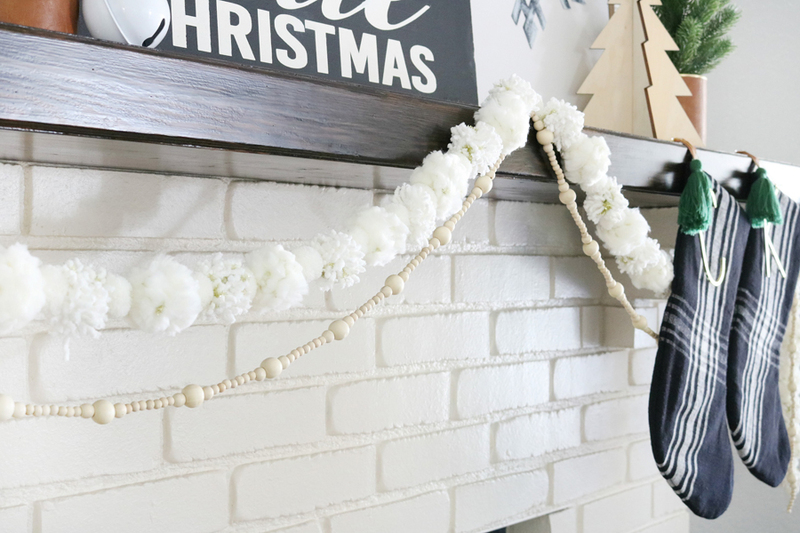 This garland is so pretty, and I love that I can use it around the house all year long. 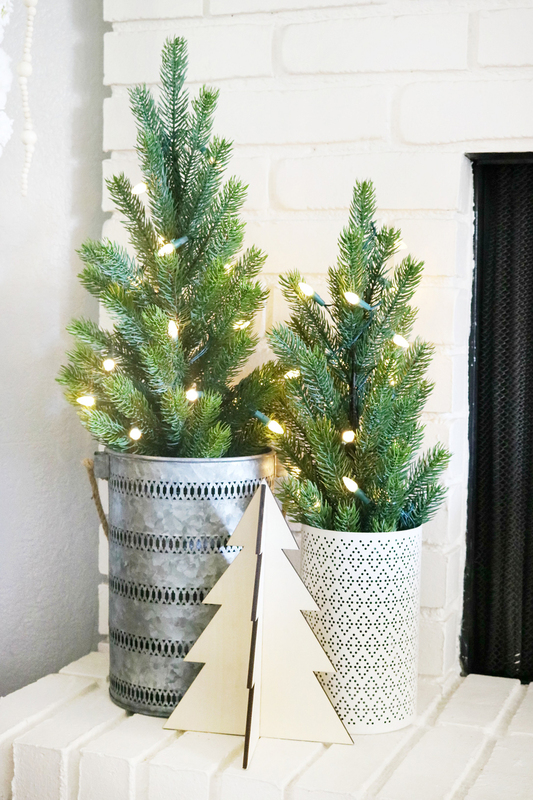 The cute mini faux trees were a great find at a local Ross store for $9 each, I’m obsessed with these kinds of faux mini trees since they look more realistic than some of the other faux trees. I added some battery operated mini vintage style bulbs, since our Christmas tree is in the other room having these small trees lit up at night makes the fireplace glow. 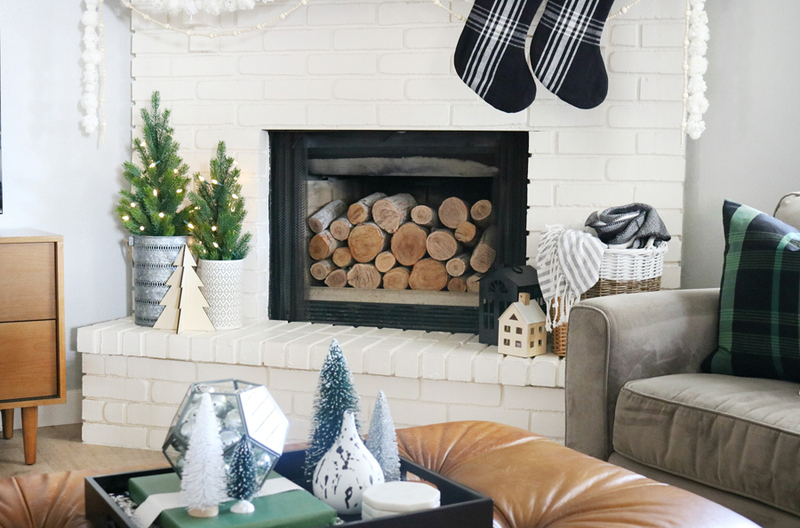 One of the last things I added were the smaller faux trees, I found these in Target’s dollar spot this year. Like last year’s Leather & Flannel Christmas Mantel, I put the smaller trees in recycled tin cans. I painted them gold first, then added some faux leather with hot glue around the middle. 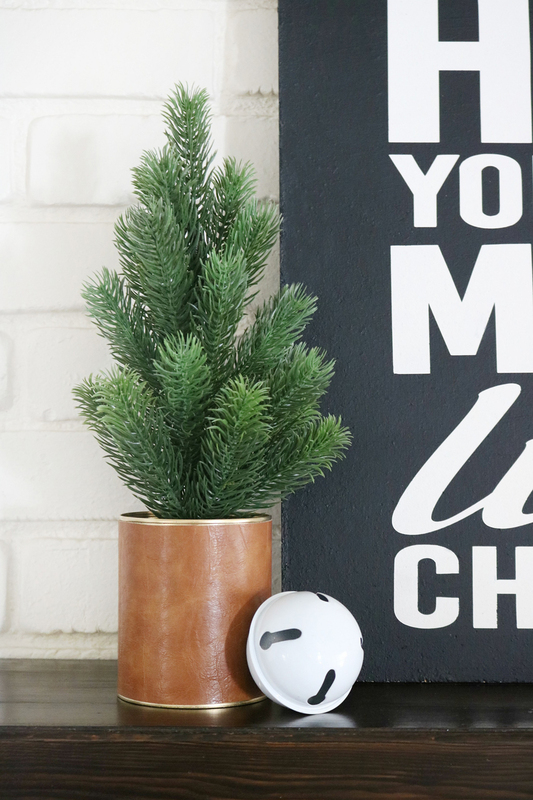 The DIY Faux Leather Christmas Tree Pillow was perfect again this year with my decor, it’s one of my favorite holiday pillows. 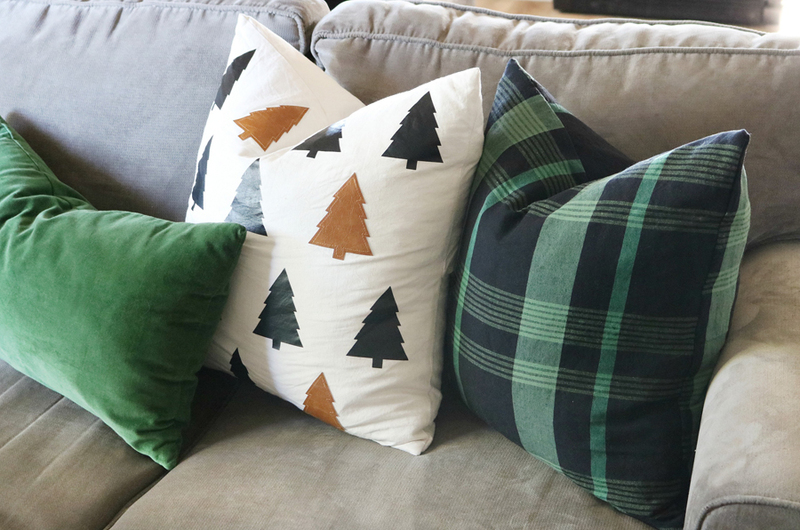 This Faux Leather Christmas Pillow was also part of the mix on my couch this year, mixed with the green velvet lumbar pillows and the pillows I made using the Hearth & Hand™ with Magnolia plaid napkins it was the perfect combo. 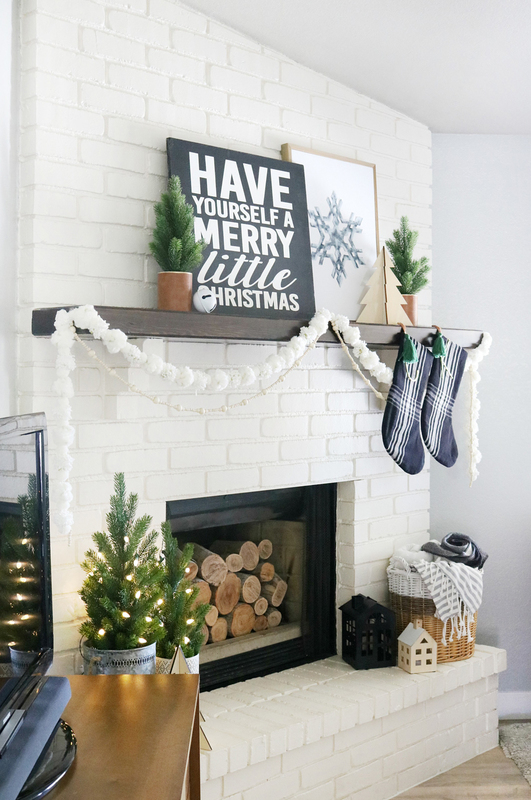 I’m really happy with how this year’s Black & White Modern Snowflake Christmas Mantel Decor turned out, after feeling stuck on it for so long and it taking me so long to finish it…I love it. 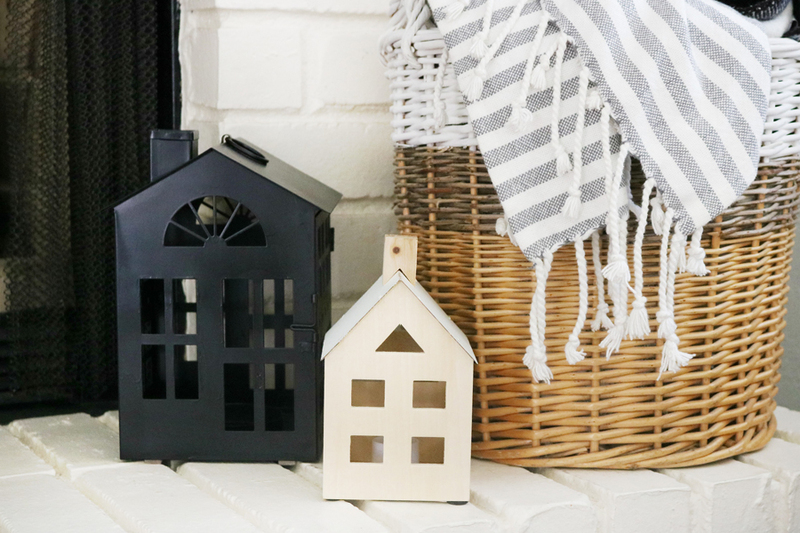 It’s simple and not overdone, it’s black and white, and it has pops of modern mixed with great textures. 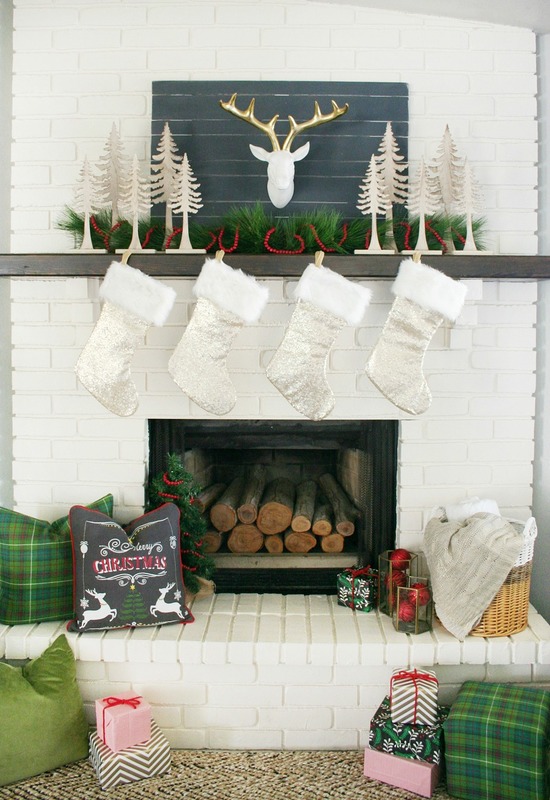 If you loved this mantel decor be sure you check out these other Christmas mantel decor ideas.